Whether you're restoring a Jeep to like-new looks or just adding some style, JustforJeeps.com has a wide selection of genuine Mopar badges and emblems that are just like the ones that originally came on your Jeep. This Jeep Overland Summit badge for the 2011 Jeep Grand Cherokee WK is an exact replacement for the original and is made by Mopar. 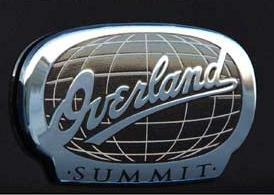 The Overland Summit emblem measures 3.625 inches wide and 2 inches tall. Overland Summit Badge Decal for the 2011 WK Grand Cherokee. Measures 3 5/8" x 2"